The Vallee d'Aosta Nus Malvoisie DOC is a dry white wine with an harmonious and pleasant taste and a delicate and persistent bouquet, which, thanks to its versatility, it combines well both with the appetizers than with pasta dishes or white meats. It's obtained, in spite of the name (that probably comes from the greek port of Malvasie in which, during Middle Ages, are marketed many quality wines), from the Pinot Gris vines, that lie between the towns of Nus, Verrayes, Quart, Saint-Christophe and Aosta and that give rise to the its golden yellow color with copper reflections. From the best grape bunches, dried in airy rooms with little light you get the Nus Malvoisie Flétri, an essence of great character who completes his training with a slow fermentation and aging in small oak barrels. The result is a real pearl of Valle d'Aosta region, a nectar that smells of dried fruit and jam, an excellent wine to "chat" or to sip with delicious biscuits. 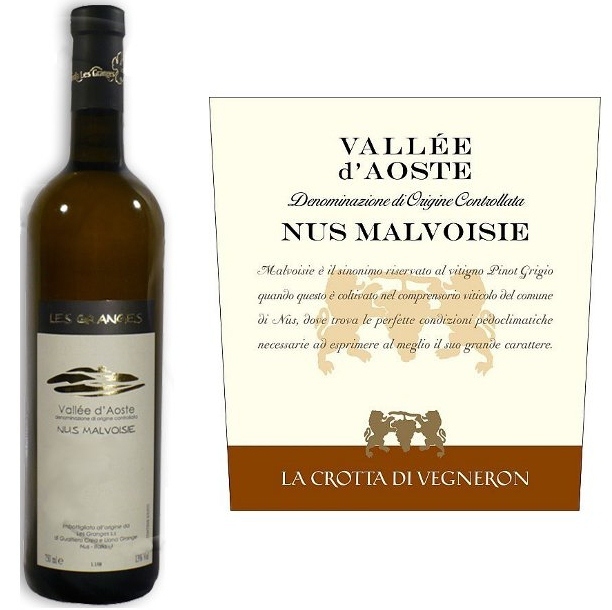 The Nus Malvoisie is an important wine both in the traditional version (11 ° -13 °), that in the Flétri version that reaches an alcohol content of 15 ° -16 °. The Nus Malvoisie DOC is a wine to be enjoyed alone or also accompaining with some cheese, maybe not too powerful so that it cannot cover the complexity of the wine, or finally with typical local salami, such as boudin or motzetta. Every two years in the month of September takes places in the park of the Aymaville Castle, a wonderful location, the event "Exposure of the DOC wines of Valle d'Aosta. This is an historic event, which brings together 40 wineries and during which visitors can taste hundreds of wines but also food products such as meats and cheeses of italian gastronomy. If you want to come visit us during this special event and book your culinary holiday here in Italy, please visit our partner site www.leibtour.com, or just send them an email to get a quote to info@leibtour.com.